Robert Funk and the Jesus Seminar, The Gospel of Jesus (Santa Rosa: Polebridge Press, 1999), p. 25. Thomas 39:3; 42; Matthew 5:25-26; 7:13-14; 10:16; Luke 12:58-59. The Un-kingdom of the Un-god is a phrase I borrowed from the late Robert Funk in his book, A Credible Jesus. Funk points out that Christian tradition turned the human Jesus into an oriental monarch. 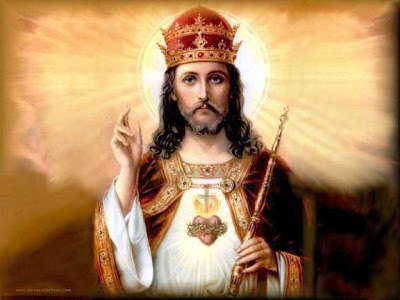 We even give him a special Sunday, Christ the King. I do like this poem by Muriel Spark, "The Three Kings". I used it during last year’s Christmas Eve service. We don’t hear too much about kings these days. Of course we do hear of dictators and warlords. Saudi Arabia has the House of Saud. They are a bit problematic, really. We don’t want to look too closely at human rights violations. It is their culture after all, we rationalize. Besides, whoever controls the oil spigot gets to be king. At least for a while. Of course there is the British royal family. I listened with mild amusement while NPR spoke about the upcoming wedding between Prince William and Kate “the commoner” Middleton. They still use that term, “commoner”. Writing in the L.A. Times, Michael McGough says that the antics of the royal family and of Hollywood celebrities in the United States are similar. For us, the joys and travails of the beautiful people in the tabloids and corporate news networks provide distraction from the news to which we ought to be paying attention. Perhaps the royal family does the same for the British citizenry. …symbolic or not, the monarchy enshrines in law a distinction between commoners and those who owe their prominence, not to mention their fortunes, to bloodlines. At least Hollywood stars earn their celebrity -- sometimes anyway. Two political parties that have little more than superficial differences. Three or four corporate food producers that control virtually all food production. Three or four energy corporations that control extraction and supply of energy. Three or four media corporations that control virtually all media, which in turn is funded and whose message is provided by these other corporations. Then provide virtually unlimited funding and access to elected officials by these corporations while distracting the populace with celebrity puff and infotainment, and you have won the day. You have sealed the deal. Give yourself a crown. It is American Empire that pretends otherwise. Boy preacher, you are meddlin’ this morning. It is Christ the King Sunday. What am I supposed to do? It is in this world of empire that Jesus appeared. Different names, same Empire. The gospels are stories of conflict. The conflict is between Jesus and the authorities. The conflict ends in his torture and execution at the hand of established authority that is Empire. You can’t get any more political than that. According to these early rabble-rousers, the Gospel story does not end there. The early followers of Jesus had the chutzpa to say that Empire did not win the day even though it had executed their hero, their un-king. They cobbled together metaphors (such as “getting up” from the dead, son of God, Lord and Savior, Peace, and Gospel). They took these metaphors that the Roman Emperor had used for himself and with tongue in cheek applied them to Jesus, this “peasant with an attitude” as Dominic Crossan calls him. Jesus is the anointed one! 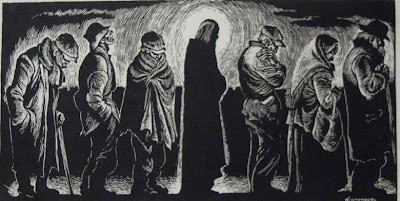 Jesus’ message of “God favors the poor” is Gospel. Jesus “got up” from the dead and is among us. Jesus is Emperor and Savior. Jesus offers peace but not as Empire gives. All of this strange juxtaposition, this odd and creatively subversive application of the honorific titles of Caesar to Jesus, helped our early heroes resist the dehumanizing forces of Empire’s boot. They found dignity and power. They found community and with that support and alternative to Empire. It is certainly true that empires and kingdoms and governments and institutions (including the institutional church) since that time have found ways to use Jesus to serve their interests. They turned him into a king, who acts like a dictator, letting some people into his kingdom and sending others (most?) to hell. That’s right. We don’t need kings. Even King Jesus. Instead, we are discovering and reclaiming Jesus the un-king. While all of this kingdom making has been happening over the centuries, at the same time there has been a prophetic voice that has been a voice for what Matthew Fox calls a Creation-Centered ethic. Jesus the friend of Earth. Jesus the way of non-violence. Jesus the gatherer of the outcast. Jesus the teller of truth. Jesus the voice of peace and compassion. Jesus the way of justice and sustainability. That is the voice we need to hear and to follow today. This voice is not loud. It is barely audible. It surfaces then goes under again. It is a voice that is sly as a snake and simple as a dove. It is a voice that learns how to settle with opponents rather than to be put in their prisons. (Although, it doesn’t always learn). It is a voice with patience. This too shall pass so be a passerby. It is a voice that speaks of the way of peace that is a narrow door few can enter because the broad path of violence looks so easy, tempting, and obvious. It is a voice of parable and subtlety that stuns the mind and disturbs the soul. It was heard in the cadences of Martin Luther King Jr.’s preaching. It was heard in the edgy wisdom of Dorothy Day. It is heard in the beat of an African djembe. It is heard in the songs of women in the Congo. At the edge of the ocean I have heard this music before, saith the body. It is the voice of the body, of bodies, of bodies diseased and beaten, of bodies tortured for greed and profit, of bodies who no longer have voices, but whose voice we hear from those who courageously carry their memory in their bodies. It is a voice that says no to greed and lies and yes to life, yes to sharing, yes to cooperation, and yes to forgiveness. All over Earth, if we listen, we can hear the voice of Jesus the un-king. Known in many forms, known beyond all religions. Underneath the din and the noise of Empire, Jesus the un-king speaks peace. Peace I give to you. Not as the world gives—not as Empire gives—not as the military machine gives—not as the profit and loss statement gives. Peace I give to you. Do not let your hearts be troubled. Do not let them be afraid. I just got the chance to listen to this sermon this evening, John, as I was creating the podcast for it. I agree with Mark and Kathy B - the only thing wrong is that it was too short.